We’re sending people on adventures across state lines with this country spanning sale. From the beaches of Hawaii, through the style and culture of Portland, all the way to Sunny Tampa, our affordable flights go all over the place. 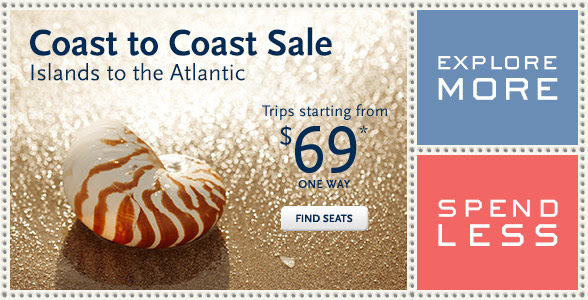 Take advantage of this sweeping flight sale and get yourself on a plane. You can have the trip of a lifetime before this year is over. Now it’s easier than ever to fulfill the dream of flying from LAX to the jewel of the South Pacific — the Cook Islands — aboard one of the world’s most highly acclaimed airlines, Air New Zealand. For a limited time only – book by July 31, 2014 for travel commencing between August 14, 2014 and January 25, 2015 – take advantage of great value round trip travel from the US at only $838 Economy class, and $1,998 Business Class. With the announcement of these special airfares, paradise is within easy reach of almost anyone. Rarotonga, the main island, is an easily accessible and bewitchingly beautiful tropical South Pacific paradise. It is essentially an “all in one” island resort, and upon arrival, visitors find themselves in a lagoon-side resort in next to no time. Getting around is also easy by renting a scooter, car, or commuting on the local bus. Once in the Cook Islands, the time of discovery begins, with many options for the adventurous: paddle boarding, kite surfing, diving, snorkeling, interior-island hiking tours, swimming in crystal blue lagoons, and lively local craft and food markets held each Saturday morning. Boutique accommodation choices in the Cook Islands range from first class indulgence to “live like a local” holiday homes and everything in between. No hotel is taller than a palm tree. Excellent restaurants are everywhere – Thai, seafood, island, Chinese, Italian – to suit all tastes and budgets. Tipping is not expected and tax is included in menu prices.